I created this map a few years ago as a way to connect Oakland and Wayne County with a transit corridor that loops around downtown and defines the central business district. Ideally, the system would have "right-of-way" so that it was separate from traffic (like the Chicago "L" and would allow the trains to operate faster from Oakland to Wayne County. 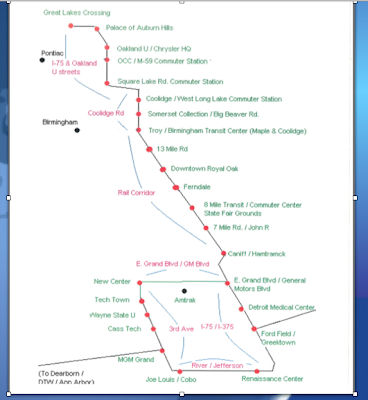 While I support the M-1 rail, especially as a way of truly defining the central business district, I think that regional rail will require something more than simply putting trains along the main arterial roads (Woodward, Gratiot, Grand River, Michigan, etc.). In my opinion, the solution requires use of all rights of way including interstates, service drives, and existing rail corridors. And if it were maglev technology, it might be cheaper to operate in the long run. Wouldn't it be great if our auto manufacturers teamed up with a company like GE and built a system like this in Detroit with the support of citizens and governments?